Reelin -N- Chillin is a remarkable 19’ x 86’ Fantasy houseboat. This boat was custom built as a show boat and no expense was spared to make her an over the top floating palace. Step on the front deck to find plenty of seating and room to entertain and enjoy. This roomy front deck offers a table and 4 chairs, love seat, 2 chairs and end table. Plus, the front deck bow splash can be turned into extra seating by bringing out the custom cushions. Plenty of room for all. Both the front and back decks have full enclosures that were made new fall 2017. Front deck also has side steps leading to top deck. Enter the salon and be ready to be impressed with the white ash wood, upgraded wall vinyl, and neutral colors. The decor is elegant and calming and has been updated to include no brass fixtures. Seating includes a sectional couch, 2 overstuffed armchairs and ottoman. Built in entertainment center and end tables complete the room. Another plus is the lower helm is hidden in a cabinet to add to the decor when at the dock. Aft of the salon is the elegant dining area and well appointed galley. Bar seating with storage runs across the boat and includes 4 chairs on the aft side. There is room for 4 chairs on the bow side as well. Further back is built in upper and lower cabinets. Turn starboard to find the well appointed galley with refrigerator with ice/water in door, trash compactor, dishwasher, smooth top range and oven, built in microwave and roomy pantry. 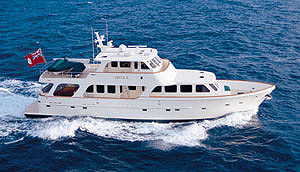 To port and down 3 steps is the forward cuddy which features a sleeper sofa, storage, and flat screen TV. Starboard side hall leads to a closeted stack washer/dryer and then to the VIP Stateroom with queen sized bed, large closets, drawer stack and flat screen TV. Accessible from the VIP Stateroom and the hall is the guest bath. Features include a neo angle shower, large vanity and linen closet. Continue down the hallway and to port, down 3 steps to the aft cuddy which includes a queen bed, flat screen TV and hull access. Further down the hall is a door to the back deck and separate door to the spacious Master Stateroom. Features include a king sized island bed, closet, drawer stack, and flat screen TV. A sliding glass door with curtains allows for a room with a view and back deck access. Or close the drapes for a truly private master suite. The Master Bath is classy with its vanity, spacious walk-in glass block tile shower and linen closet. 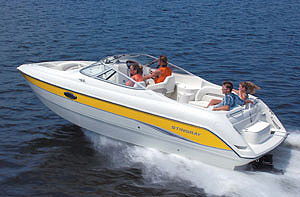 Move onto the back deck to find simple seating, storage lockers, and 3 large hatches for easy engine access. Boat is powered with twin Mercruiser 5.0 L Bravo II’s and a 20 kw Westerbeke generator along with hydraulic bow and stern thrusters. An auto oil change system has been installed which makes routine maintenance easy. There is also a 4’ swim deck with jet ski ramps plus outside shower. There is a PWC fueling station so no need to go back to the dock when out in a cove and using the jet ski. This is a great space to enjoy the water and clean up before going indoors. A spiral staircase provides access to the top deck. The top deck is roomy, well appointed and the ultimate entertainment spot. The flybridge allows for top deck driving with plenty of seating for guests to keep the Captain company. An octagon bar package includes built in grill, refrigerator, ice maker, storage and bar stools. Multiple chaise loungers and table with chairs provide the space for sitting and enjoying the sun. Top deck also includes slide access for a fun way to the water. There is a 36’ hard top to provide shade and the framework for a top deck enclosure. So much space and so many ways to enjoy the water and the view. 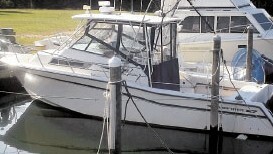 This boat has had many recent updates in the last 2 years including deck carpet, A/C system, roof, and drives serviced. 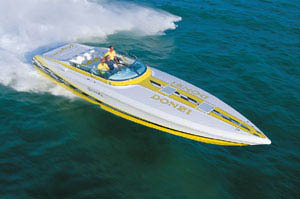 This boat truly is a must see and is ready to use and start enjoying the water. Hurry and call today as this boat will not last long on the market. 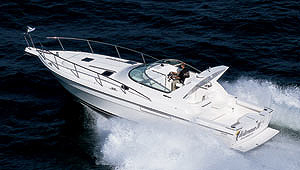 Twin MerCruiser 5.0L Bravo II 209 hr.